Videos serve as an instant marketing tool. Visual effects in videos enhance the probability of sales conversion by a huge margin. This fact is recognized by most businesses and is the reason why video production in Dubai is extremely popular. Business video production is recognized as an important step that can be used to put across the essence of a discussion in a precise, yet effective manner. We are a promotional video company that combines technical expertise with a keen aesthetic sense to produce high quality videos. We are highly recognized for our corporate video production services in Dubai and create well-crafted, informative and interesting videos for clients in the public and private sectors. 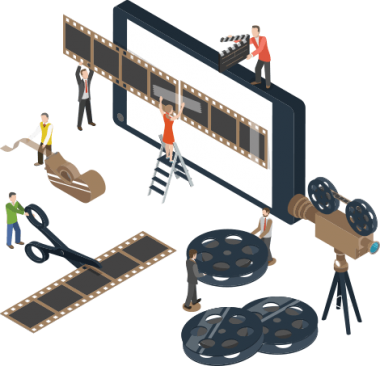 Our productions are widely distributed and we serve as one of the leading animated video production companies in Egypt. The videos that we create are flawless in production and promote content that strikes a chord with the audience. We have a knack for depicting ideas clearly by means of creative videos. We create high definition videos for the web and help businesses achieve their business goals through our corporate video production in Dubai. Reach us for your specific requirements relating to business video production.